This blog was written by Funmi Agbesanwa who is in her second year of her PhD at the School of Pharmacy. Her supervisors are Dr Matthew Boyd in the School of Pharmacy and Dr Simon Bishop from Nottingham University Business School. What is the typical PhD journey? You decide to do a PhD, you start said PhD, navigate through the 3-4 years, finally finish writing the thesis, do the viva and ultimately end the project. Somewhere down the line it may strike you that actually, you may not want to stay within traditional academia after completion. 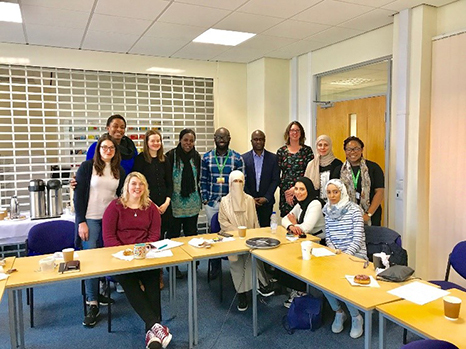 Within my division of Pharmacy Practice and Policy, we have monthly postgraduate study group sessions for PhD students on topics such as qualitative data analysis, PhD top tips and viva preparations. Recently, I had the opportunity to organise a slightly different study group; a session on non-traditional careers post-PhD. Three speakers from different career sectors came to give us 10 minute talks on their career journey so far post PhD. Speakers included a senior research fellow, a Quality Assessor at the UK Government Medicines and Healthcare products Regulatory Agency and a researcher trainer and development manager from the University’s Graduate School. All three speakers were ex-Nottingham students who had all previously completed PhD’s within the School of Pharmacy. 10 PhD students came for the event – the highest attended study group session! All students were at different stages of their research; including new starters, those collecting their data and those writing or having just submitted their thesis. We are all on our own individual journey – no journey is alike and we are all different. The aim is to find out what you enjoy and start from there. List the roles you definitely don’t want to do first. Identify your skill set: what skills do you have now and which do you need to improve? Challenge yourself and take hold of opportunities. Travel, meet and talk to others about their careers, get involved. Experiences make us richer people. It was great hearing from a range of people, who had previously walked in our very own shoes. It was also very useful to bounce career ideas off one and another within an informal and supportive environment. Everyone enjoyed the session and it provided a good networking opportunity! Nottingham subjects continue to be among the best in the world – including Pharmacy!